If you know me, you know that I am a scrap quilter at heart. This means that I save every little piece and I hate waste. I will dig fabric out of the trashcan what others have thrown away. And I will go out of my way to avoid waste if possible. So, when it comes to the sew and flip method, I have a love/hate relationship. I LOVE how easy it is and all of the possibilities for precise piecing. But, I hate those odd leftover pieces. I save almost all of them to be used SOMEWHERE. When the new block for the Crossroads quilt along came out a couple of days ago and I saw all of those sew and flip corners, I cringed just a little. I am using a layer cake for most of my fabric, so every little piece is precious. I decided to do a little experimenting and try to figure out how to make those square in a square blocks without the waste. And here is where the story of The Three Little Bears comes into play. Using a little quilty math guesstimation, I decided to try cutting that center square at 2 1/8 inches. From the background fabric, I cut 2 squares 2 1/2 inches and then cut them diagonally to make 4 triangles. Well those center squares came out just a little bit too small. They didn't quite touch. I decided to try the center square at 2 3/8 for the next one. A little too big, I really had to work to make these fit and they are a little wonky. So for the final block I went in the middle with a 2 1/4 inch square. Ahhh, just right. Here are the diamond blocks all together. And here are my house blocks together. If not, it is not too late to join in. 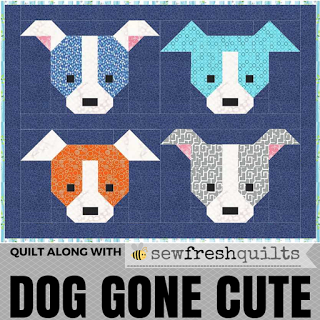 The pattern is free over at The Fat Quarter Shop. They are asking everyone to donate to the March of Dimes this year in return for a fun year of quilting along. Ha ha, my sister is a dumpster diver for fabric scraps!! I am working hard to not save every last piece, but old habits die hard. I like reading about your experimenting process. And, each block has character. I like the floating effect of the first block. Tracy, I received a Stash Bee block from you and don't know how to contact you, but thank you sew much! Your cowboy block is very handsome! Happy Sewing.